What's the difference between a Personal Chef & a Private Chef? Personal Chefs serve multiple clients, and are available for one-time private celebrations, or scheduled services like developing a personal food program for your family, and preparing meals for the week, etc. A Private Chef is contracted to one private estate or family. Private Chefs offer greater functionality, and services are usually more expensive than Personal Chefs. 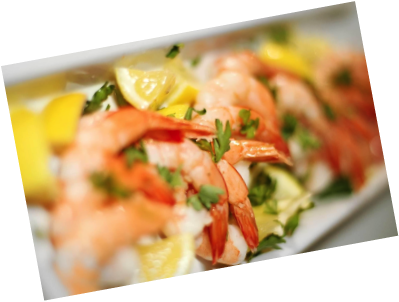 Our Personal Chefs prepare gourmet meals for hosting house parties, small special occasions such as birthdays or anniversaries, corporate luncheons, etc. ; basically anywhere there is a kitchen on-site. We also offer in-home preparation for your individual or family meals, spending several hours in your home preparing your weekly selections. After completing a Client Assessment Interview to better understand you and your family's dietary needs (i.e. allergies, like, dislikes, preferences, etc), our Personal Chefs will create a custom menu spread that satisfies your unique needs and preferences. We will package your food products and provide detailed heating instructions. Typically, a Personal Chef will spend about 4-5 hours preparing delicious meals for you, in the comfort of your own home. The majority of the groceries needed for your personal menu is included. Your Private Chef is assigned only to you, at your disposal whenever you need, according to your negotiated contract. Custom meals prepared in your home each day. Entertain guests in your home, at your office, yacht, private aircraft, etc. Custom Menus for Special Events like: Conventions, Demonstrations, Workshops, or Shows.